A Windows' software to simulate a trawl gear, in order to provide information related to geometry and forces. 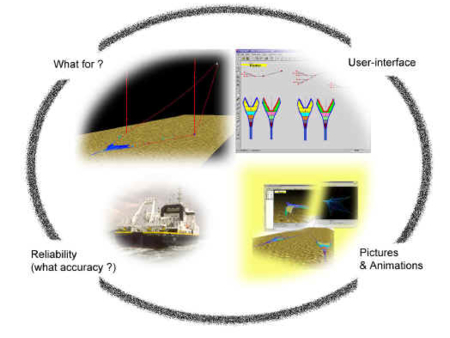 For over ten years Ifremer fisheries technology labhas been working on the development of a dedicated trawl behaviour simulation software. The DynamiT user interface is based on the Microsoft Windows mechanisms, ILOG libraries for the 2D interface and OpenGL for the 3D views. What is the use of the software ? Concurrently to the developement of the software, the numerical model used to simulate trawl gears has been validated by sea trials. Two measurement trials were conducted aboard the oceanographic vessel Thalassa, taking advantage of acoustic surveys implementing a pelagic trawl and a survey bottom trawl. Validation trials were also achieved abord the coastal oceanographic ship Gwen Drez. For each trial, distances (vertical and horizontal openings, door to door distance) and tensions in the rig were measured by means of acoustic sensors and autonomous force cells. Despite the fact that we cannot guaranty that DynamiT will always provide results as good as those presented below, we believe that this software is the most suitable tool to provide detailed and reliable information relative to a trawl gear.